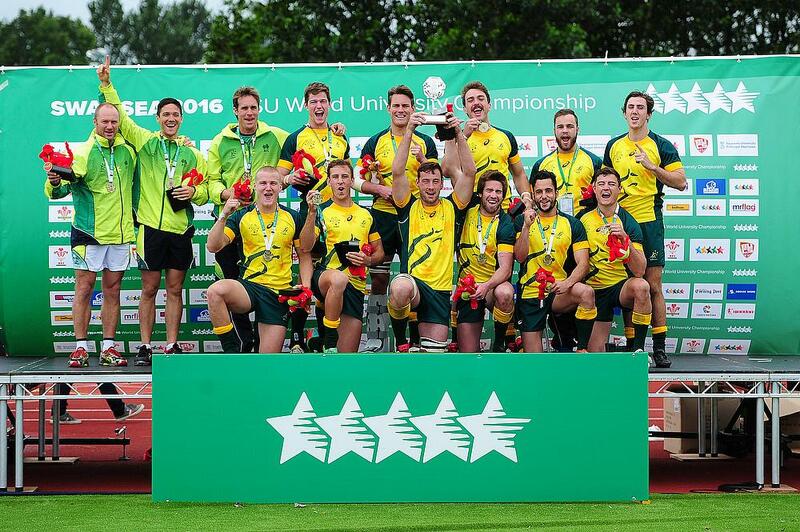 Australia and France stun holders Great Britain and Canada to win in the 2016 World University Rugby Sevens Championships in Swansea. 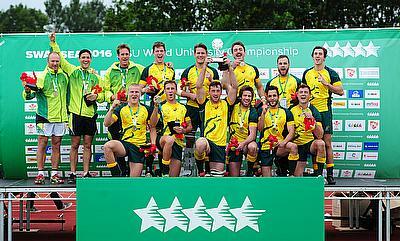 Connor Mitchell scored a try in the final play of the game as Australia came from behind to win the Men’s World University Rugby 7s Championship, beating Great Britain 24-20 in a pulsating final in Swansea. Sam Pointon looked as though he had given GB the victory, but Australia snatched it right at the death to secure the gold medal. 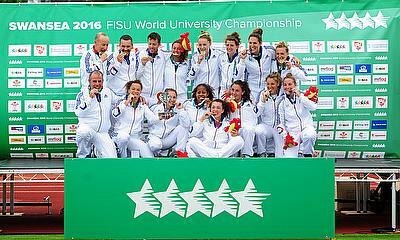 France, who were the runners-up in the Women’s Championships in Brazil two years ago, exacted their revenge over Canada as they clinched the gold medal in the Women’s Final with a 31-5 win. Lenaig Corson and Joanna Sainlo both scored twice to put the icing on cake for Les Bleus who completed the tournament unbeaten. Elsewhere, Great Britain’s Women ended the championships in fifth place as they beat Italy 15-10 in their play-off match. 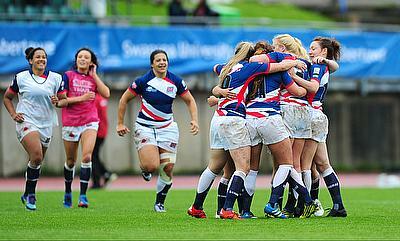 A late try from Abigail Walker secured the win for GB after scores from Robyn Wilkins and Kelly Smith. Namibia completed their tournament with a 15-0 victory over Italy to finish in fifth place overall. Tries from Muharau Katijieko, Lesley Kim, Daniel Bock and Sunay Haitembo gave them their second win against Italy of the competition after both sides had met at the pool stages. The African side prevailed 40-12 on that occasion. Malaysia got their first win of the tournament in their opening match in the 7th place play-off after a 19-7 victory over the Czech Republic. Malaysia finished bottom of their group with three just points, but after this win, they knew they had to beat fellow Pool B side Argentina to finish seventh. In the pool stages, Los Pumas defeated Malaysia 35-5, but this contest was much tighter for the majority of the game despite Argentina ultimatleyclaiming a 21-7 victory. Tomas Kerz, Rogelio Sanchez and Ignacio Fondevilla all crossed the whitewash meaning Argentina were in the driving seat to secure seventh spot heading into their final match against the Czech Republic. With the Czech Republic having lost all six of their matches, the odds were firmly stacked against them leading up to this clash with Argentina. But when Martin Sadilek opened the scoring for the European side, an upset looked on the cards. However, Argentina showed their class as Fondevilla along with Fermin Etchegaray dotted down to secure seventh place for the South Americans while Malaysia and the Czech Republic had to settle for 8th and 9th respectively. A last gasp try from Abigail Walker sealed fifth place at the championships for Great Britain following a 15-10 win against Italy. After the disappointment of not reaching the finals, GB performed superbly against Spain yesterday to set up this clash with Italy. Wales’ Robyn Wilkins gave them the perfect start as GB dictated the opening half, however the scores were level at the interval when a break from Isabella Locatelli led to Italy scoring their first try of the match. It wasn’t long before Italy gave themselves the lead as Lucia Cammarano went over straight after the restart, but some excellent play by Wilkins set Kelly Smith free who raced away to tie the game up once again. GB then put the pressure on the Italians who were standing firm. But, their resistance was broken in the dying embers of this contest as Walker smashed her way through the blue wall to clinch the victory for Great Britain. Great Britain Coach Susie Appleby: “The win against Italy shows how far we have come as a team. Of course, it is tough getting a team to gel quickly and get that understanding between each other, but the result against Spain yesterday and today against Italy shows how fantastically well the girls have done. "Yesterday, we had two tough results. Against Japan, we didn't really expect to lose which was disappointing and France just proved too strong for us. We had to respond against Spain and the girls did just that and our attitude against Italy helped us get the win. "We've had to swap and change the team before and during the tournament due to injuries and players not being available, but we have such a talented pool of players who have stepped in a done such a good job for Great Britain. The future is bright." China came from behind against Spain to finish seventh following a 10-7 victory. After the heartbreak of missing out on the finals, China responded well in this play-off match despite trailing this game at half-time. Scores from Xu Yang and Miaomiao Zhang helped them to their third and final victory of the tournament. Rivals New Zealand and Australia battled it out for ninth place in the first Women’s play-off of the day and it was the All Blacks who triumphed as they won 21-5. New Zealand had lost all five of their pool matches leading into this encounter with their near neighbours, but theyshowed their quality in their final match of the championships thanks to tries from Sauimoana Solia, Elizabeth Goulden and Georgie Daals. 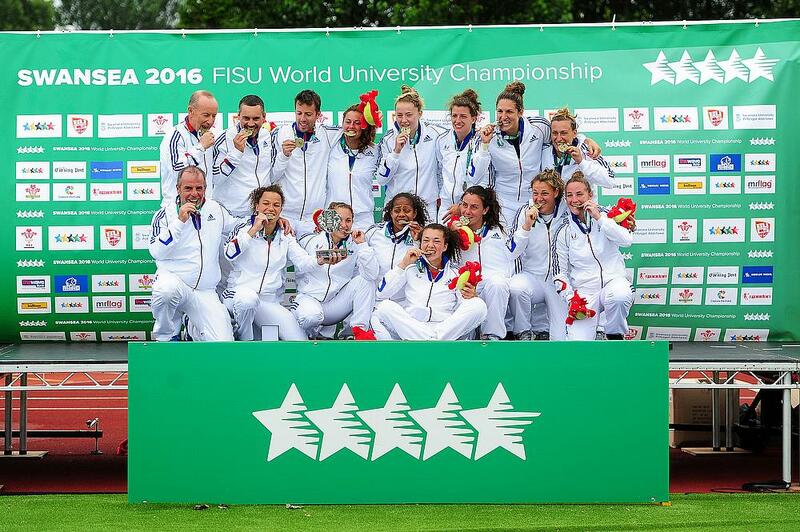 Great Britain made it through to the 2016 final following a gutsy 10-7 win over France. Charles Kingham and Patrick Jenkinson both dotted down for the hosts in the first half before France responded after the break. Bury St Edmunds’ Pierre Peres went over for Les Blues which was followed by waves of France pressure, but GB stood strong to claim a place in their second final in two years. Australia maintained their 100 per cent record in style as they beat Spain 43-0 to book their place in the final. Brandon Quinn, Connor Mitchell, Liam McNamara, Lachlan Anderson (2) and Tim Astee all scored for the Wallabies as they began day three in ruthless fashion. France became the first side to reach the World University Rugby Sevens final after a convincing 26-0 win over Pool B runners-up Portugal. The silver medallists of two years ago dominated proceedings in the driving rain in Swansea to book their place in the final for the second successive tournament. And it was to be a repeat of the 2014 final as reigning champions Canada narrowly beat Japan 7-5 in the second semi-final. The holders, who have now reached the final for the fourth tournament in a row, had to battle hard for this victory and defended resolutely in the final minutes of the game as Japan hammered at the door. France put their semi-final defeat to Great Britain behind them as they beat Spain 27-7 to take home the bronze medal in the Men's tournament. These two sides met on day one of the championships in Pool B with France beating Spain by the same score line on that occasion. Despite trailing 7-5 at the break, four second-half tries by France took the game away from the Iberian side and secured Les Bleus third spot. In the Women’s play-off, four tries was enough for Japan to end the 2016 championships in third place. The Blossoms had beaten Great Britain to second spot in Pool A and won four of their six matches at this year’s tournament. As for Portugal, they performed superbly to qualify from Pool B in second place and they end the competition with two wins to their name. Great Britain were looking to avenge their Pool A defeat to Australia in the Men’s Final and it seemed like they were on course to do just that before a late from Connor Mitchell snatched the victory and the title for the Wallabies. GB flew out of the blocks in this final as Patrick Jenkinson crossed inside the first 30 seconds and that was swiftly followed by a beautifully worked try scored by Chris Leversley. Australia hit back through Lachlan Anderson midway through the half and it wasn’t long before the Wallabies had their second try as the Wallabies touched down under the sticks. Australia continued to take control just before the break as Merritt darted over to leave GB trailing 19-10 at half-time. GB knew they had work to do after the break and James Beal got them off to the perfect start as he dived over in the corner to reduce Australia’s lead to just four points. Then, with just a couple of minutes remaining, Captain Sam Pointon scooted over the whitewash to give GB a slender advantage as the game reached its climax. The Wallabies went on the offensive and with the final play of the game, they worked the ball out towards Mitchell who sprinted into the corner to leave GB crestfallen and Australia jubilant. Great Britain's James Beal: "Obviously, we are gutted. In sport, it's about narrow margins and we were on the wrong side of it today. We can hold our heads up high because we have done well in both defence and attack this week and we pride ourselves on that. However, we are clearly disappointed that we couldn't take gold as the final was in our grasp, but it was the narrow margins that cost us today. 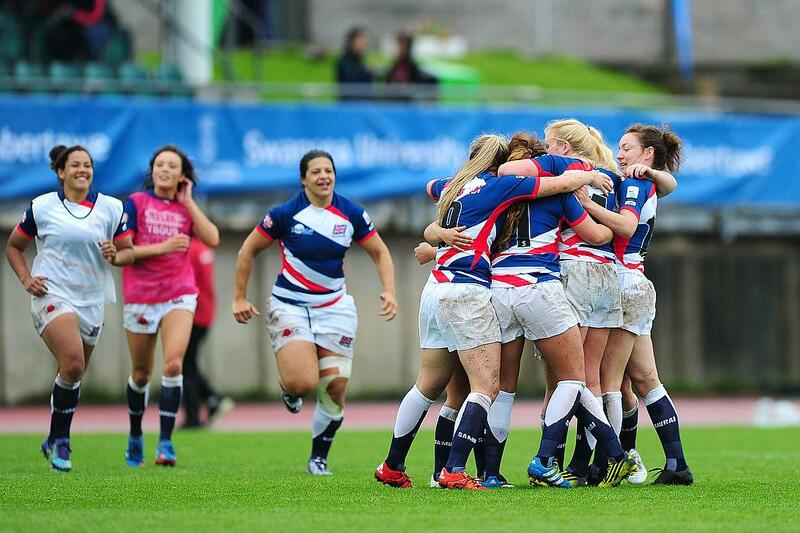 "It has been an honour to play for Great Britain with such a good bunch of lads. A lot of the boys will go on to big things in the game and its great to have played under the likes of James Farndon. Aaron James and Phil Llewellyn. On and off the pitch, it has been a great experience." Following defeat to Canada in the final two years ago, France gained their revenge this time around as they defeated the North American side 24-5 to clinch the gold medal. After leading 19-5 at half-time, Les Bleus continued to dominate proceedings in the second period, highlighted by Joanna Sainlo’s second try straight after the interval. France had rarely looked troubled throughout these championships and that trend continue into this final as they controlled it from start to finish.